Symptoms vary depending on the location of the stenosis. A narrowing in the lower area of the back often results in pain and numbness in the legs, while narrowing in the upper back and neck results in pain in the shoulders. Who is Susceptible to Spinal Stenosis? Individuals over the age of 50 are susceptible to stenosis because of wear and tear. However, individuals that have suffered a back injury may be more at risk to develop spinal stenosis at an earlier age. What Areas of the Spine are Involved? With spinal stenosis, bone spurs or overgrown soft tissue may lead to pinching of spinal nerves and pain. 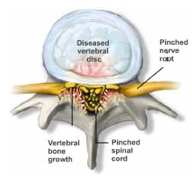 Intervertebral disks – these disks act like shock absorbers between each vertebra. They are made of cartilage and are filled with a soft substance. Over time these cartilage disks can wear down and dry up leading to increased pressure shifting to the facet joints. These joints have a higher propensity for arthritis, with overgrowth of bone and soft tissues which can pinch on nerve roots. Facet Joints – these joints connect the vertebra together allowing the individual to bend backward. Neural foramen – neural foramen are openings between vertebrae allowing nerves to extend out towards other areas of the body. 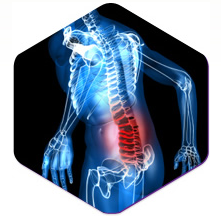 Ligaments – ligaments support the spine by preventing disc slippage as the spine moves. Spinal cord – the spinal cord is a major component making up the central nervous system. It is housed within the vertebral column and is made up of bundles of nerves and nerve cells. Spinal stenosis can be inherited or acquired. Individuals that inherit the disorder can be born with a small spinal canal or may have an abnormal curvature in the spine known as scoliosis. Regardless of how the condition has manifested, the result is overcrowding in the spinal canal leading to compression and pressure on nerves and tissue. Notice the bone spurs from arthritis pinching on the nerve roots as they try to exit from the spinal canal. spurs. Osteoarthritis affecting the facet joints is known as spondylosis. Rheumatoid arthritis – this type of arthritis commonly strikes earlier than osteoarthritis. It causes inflammation of the soft tissues and joints. 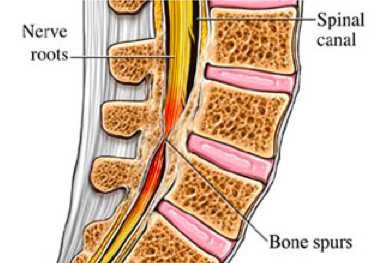 Trauma (injury) to the spine – trauma caused by accidents can lead to disc location or fractures as well as the early onset of arthritis leading to spinal stenosis. Spinal tumors – tumors may grow in the spinal area affecting the canal by causing overcrowding, bone loss and bone displacement. Paget’s disease – this is a disease causes enlarged bones that commonly attacks the spine. Dwarfism – there are genetic factors involved with certain types of dwarfism and a propensity for spinal stenosis. 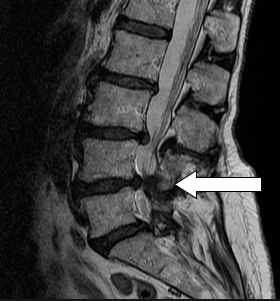 MRI showing bulges from stenosis pinching on the spinal canal. Those are “hard” discs that are arthrtiic and bulging backwards. 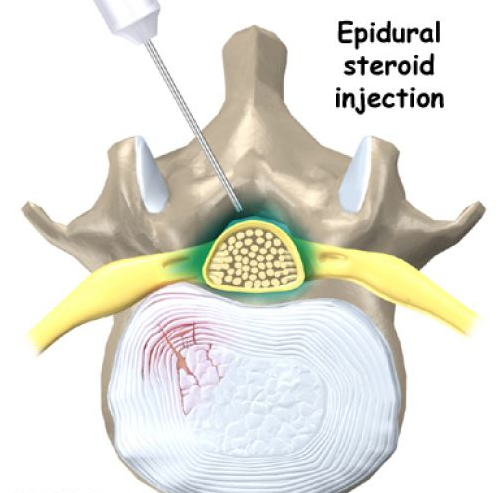 Corticosteroid injections – steroid injections into the membranes covering the spinal cord and roots to reduce inflammation and pain. Anesthetic injections – this type of treatment is referred to as a nerve block used to relieve pain. Other forms of non-invasive treatment includes lifestyle modification such as healthy diet, non-impact exercise such as swimming, restricted activity, use of a back brace and physical therapy. When is Spinal Stenosis Surgery Considered? Surgery is considered if spinal stenosis affects walking, bowel movements and other neurological issues. It is also considered if non-invasive treatments do not mitigate pain. Surgery is done to relieve the pressure on the spine and nerves by trimming, removing or adjusting affected areas. Clinical research conducted by the Spine Patient Outcomes Research Trial showed that surgery was more effective at relieving pain and increasing mobility compared to non-surgical treatments (Weinstein et al 2008). If you experience chronic pain and suspect spinal stenosis, it is important to have your condition examined by a medical professional. You do not have to put up with chronic pain. If you experience symptoms that have gradually worsened over time or have persisted for more than six weeks, seek medical care from a pain management doctor in Fort Myers. Simply fill out the contact form or call (239) 288-0072 today for assistance!